On behalf of REMA TIP TOP AG, VULCTECH GmbH has delivered an impressive innovation to Brazil. The REMA TIP TOP subsidiary from Altdorf specializes in the development and production of high-end vulcanizing presses for splicing of conveyor- belts. With the new vulcanizing press Vulcpress IVE, VULCTECH GmbH has again succeeded in launching several promising new developments. 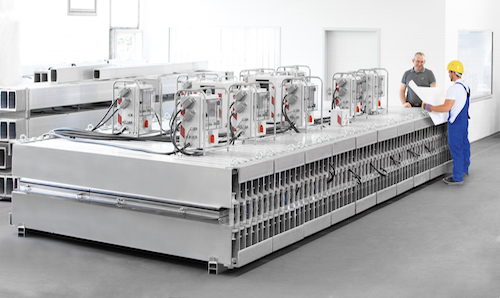 The modular press system is not only perfectly adapted to its tropical application, it also relies on the unique control system so far, which guarantees stable and uniform splicing results even in large dimensions. Vulcanizing presses, for splicing of fabric and steel cord reinforced conveyor -belts, deliver extreme performance in the toughest conditions and in often inaccessible areas. Therefore, the REMA TIP TOP subsidiary VULCTECH is setting up its "Vulcpress IVE (Innovative Vulcanizing Equipment)", which has been successful on the market since 2015, in such a way that the press can be modified to meet customer-specific requirements. The model that VULCTECH has now delivered to Brazil is also a special development. Even if the vulcanizing presses from VULCTECH are designed upon request, they all have one thing in common: they meet the highest safety standards. Technical Director Andreas Knothe emphasizes: "High pressure, high temperatures and large dimensions - with products as powerful as the Vulcpress IVE, absolute safety is essential. The vulcanizing press that we delivered to Brazil, like all others, was thoroughly tested. The TÜV has tested the mechanical-physical properties and confirmed the safety of the system. " As with all VULCTECH-IVE presses, the conveyor- belt ends to be connected are pressed and heated between the pressure pad and the heating plate so that the vulcanization process is controlled - temperature and pressure create a durable splice of all rubber plies. Depending on the application, the pressure pads can be filled with air or a water glycol mixture. In the model that has now been delivered to Brazil, the water glycol mixture provides the necessary pressure. The insulating plates in the heating plates of the press used to heat the cords are not made of plywood as usual. Instead, glass fiber reinforced plastic was used, which much better suits the tropical climate of the application area. With its sophisticated, modular design, the press can vulcanize conveyor- belts with widths of 1.25 meters to 2.45 meters. Overall, the system consists of many elements. For a 2.45 meter wide conveyor belt, all elements are built together; if smaller belts have to be vulcanized, the press can be divided into two self-sufficient vulcanizing presses. In this special version the Vulcpress IVE can work with a maximum pressure of 16 bar. The vulcanizing programs in the press are fully automated. Andreas Knothe reports: "We generally value the highest level of user-friendliness in our systems. After cooling the press, the water glycol mixture from the pressure pads can be automatically extracted without any mechanical effort (no unplugging and replacing the pressure hoses). All processes are subject to precise monitoring, which we have visualized via WLAN". In real time, the user keeps track of the most important parameters such as outside temperature, humidity, temperature in the control cabinet and, of course, press pressure and vulcanization temperature. For complete documentation, the progress data is automatically recorded and can be released via USB port. This way, it is possible to trace the progress of a special vulcanization process even years later. Among other things, the VULCTECH Safety System ensures safety in the process. It protects the heating elements by only starting the press when all three phases are connected to the mains and the mains voltage is not exceeded or undercut by more than 10%. With all the high-quality components and perfectly matched dimensions, it is the control system that makes the Vulcpress model so unique for Brazil - not only because of the control and safety devices, but above all because of a master-slave system for controlling the heating plates that has never been integrated into a vulcanizing press in the world before. In conventional vulcanizing presses, the heating plates of all control cabinets are started one after the other. Accordingly, they heat up with a time delay. In extreme cases, this means that while the conveyor-belt is still being heated in the middle, it is already cooling down again at the edge. This has a negative effect on the vulcanization results. With the new Vulcpress IVE, however, a central master control cabinet is superordinated to the so-called slave control cabinets, which control four heating plates of the vulcanizing press each. It ensures perfect timing and precise coordination of the control cabinets so that all 36 installed heating plates build up temperature at the same time. The conveyor belt is evenly vulcanized over its entire width - for a splice of stable durability on which the operator can absolutely rely. Andreas Knothe looks to the future: "With the new system we are already setting standards. But we will continue to develop our presses and their control cabinets in the future so that we can soon report on the next groundbreaking innovation". REMA TIP TOP is a global system provider of services and products in conveying and processing technology as well as tyre repair. The company has a global service network and offers a wide range of rubber products, rubber coatings and coatings for the industry as well as in the automotive sector. The company has built up a unique expertise in material development and industrial services for nearly a century and is active in the Material Processing, Surface Protection and Automotive divisions. At the end of the 2017 financial year, REMA TIP TOP generated sales of over one billion euros. The company employs more than 6,900 people worldwide and has more than 150 subsidiaries and affiliates - including well-known brands such as Dunlop Belting Products South Africa, Cobra/ Depreux and Asplit.